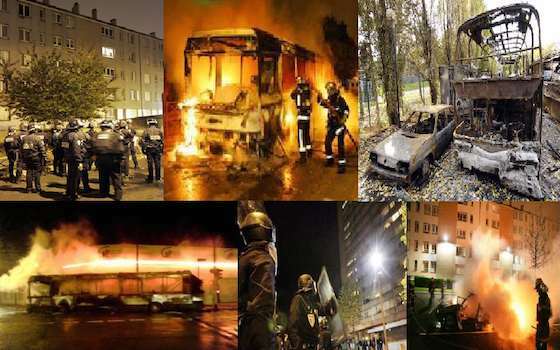 In the autumn of 2005, as the banlieues of France were convulsed in rioting, the scale of the unrest revealed deep fault lines. During three weeks of civil disobedience, 4,700 people were arrested. The violence saw 10,000 cars torched and 300 buildings set on fire. More than thirty towns and cities witnessed disturbances. Most of the protesters were second and third generation Muslim immigrants. As disorder intensified, the French Cabinet crossed a Rubicon on November 8 when it granted local authorities the power to impose curfews and restrict the rioters' movements. Dominique de Villepin, the Prime Minister, declared: 'The republic is at an hour of truth.' The law that gave him these emergency powers bore a heavy historical burden. It was originally passed to suppress violence which stemmed from the war of Algerian independence from France in 1955. The long shadow cast by France on its former colonies in North Africa is the subject of "The French Intifada: The Long War Between France and Its Arabs " by the British historian and biographer Andrew Hussey, dean of the University of London Institute in Paris. In a thorough historical evaluation of the Maghreb, he examines France's engagement with Algeria, Tunisia and Morocco, a story of 200 years of invasions and immigration across the Mediterranean. At the outset, the French approach to colonialism was different to the United Kingdom's. The British Empire achieved wealth and power by essentially enslaving its subjects through force. The French, on the other hand, embarked on a 'mission civilisatrice', an ambitious plan to 'civilize' the non-Christian populations of Algeria, Morocco and Tunisia, although there was always an element of force used to hasten people towards this 'civilization'. The central doctrine of mission civilisatrice sought to educate Algeria's Arabs and Berbers in French history and values. French was taught in schools and Algerians were put to work in lowly positions in French-run ministries. Many Algerians were led to believe that they would earn French citizenship. However, from the moment a handful of soldiers climbed out of landing boats on to Algerian soil on the morning of June 14, 1830, the highminded values of the colonial enterprize looked suspect. Within years of the French landing, a cacophony of languages including Spanish, Italian, Corsican, Catalan and Maltese were competing with the local dialects of Arabic and Berber. Many Muslims there -- and in Morocco and Tunisia later -- concluded they had been conquered by Europeans on all fronts. A cycle of harsh colonial rule led to revolt, waves of immigration to France, revolution and eventually the growth of militant Islam. Nowhere were the effects of mission civilisatrice more evident than in Algeria during its war of independence. Between 1954 and 1962, a million people died in a three-way war between French troops, their loyalist Algerian partners and pro-independence forces. The relationship was just as fractious during the two world wars. Nearly one hundred years ago, 120,000 Algerians were forced to resettle in France and take labouring jobs to replace Frenchmen called to the First World War trenches. Many were met by racism and hostility. In 1944, several hundred thousand Algerians fought German forces on the beaches of Normandy with many of them dying for France, a country in which they had no status. Hussey has written a well-researched account of French rule in North Africa. The book is full of eyewitness reports by the author and interviews in Algiers, Casablanca and Tunis as well as the banlieues of France. He is, however, on less firm ground on the fallout from the Arab Spring in France. The spectre of a "French Intifada " evokes images of North African youth as Palestinians and the French authorities as their Israeli opposition. Neither analogy is true. Hussey ends with the threat of a soaring, disenfranchised immigrant population which will outnumber the two million inhabitants of Paris. The inference here is a race war, which seems unlikely. Perhaps the lesson to be learnt from French colonialism is that the ruthless drive for Eurocentrism had the opposite effect: it only served to encourage unrest. Empires rise and fall for myriad reasons. As the British experience has shown, former subjects are not always future enemies. "Legacy Of France's Colonial History Being Played Out in Paris Suburbs"